Austrian rabbi; born at Weisskirchen, Moravia, Oct. 1, 1835; son and successor of Abraham Placzek. In 1858 he founded a high school at Hamburg, and two years later was called to Brünn. Since 1884 he has been styled "Landesrabbiner" of Moravia, after having had charge of that rabbinate as assistant to his father from 1861. It is mainly due to him that only men with an academic and theological training are appointed as rabbis in Moravia. Placzek is now (1905) chief rabbi of Brünn, a knight of the Order of Francis Joseph, and curator of the Israelitisch-Theologische Lehranstalt at Vienna; he was likewise founder of the Proseminar, with which a cantors' school is connected, as well as of a number of philanthropic societies. He is an honorary member also of several political societies. 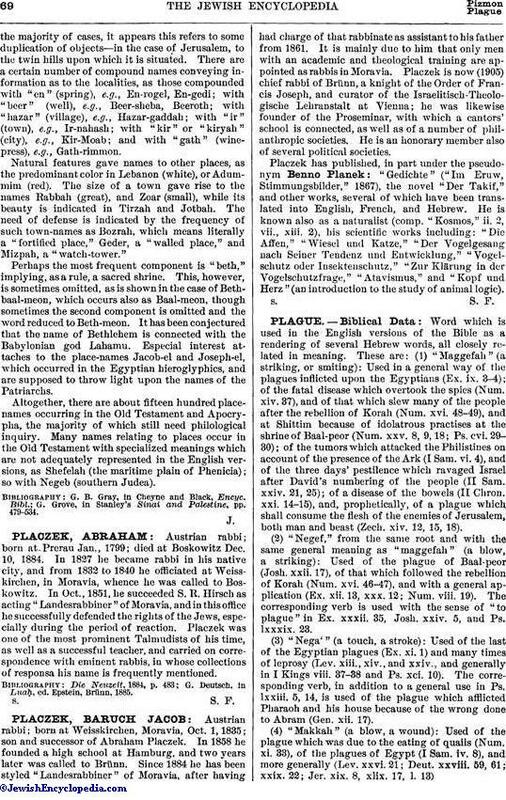 Placzek has published, in part under the pseudonym Benno Planek: "Gedichte" ("Im Eruw, Stimmungsbilder," 1867), the novel "Der Takif," and other works, several of which have been translated into English, French, and Hebrew. He is known also as a naturalist (comp. "Kosmos," ii. 2, vii., xiii. 2). his scientific works including: "Die Affen," "Wiesel und Katze," "Der Vogelgesang nach Seiner Tendenz und Entwicklung," "Vogelschutz oder Insektensehutz," "Zur Klärung in der Vogelschtzfrage," "Atavismus," and "Kopf und Herz" (an introduction to the study of animal logic).